Clayton Kershaw yields just one run and five hits, while striking out seven in a 3-1 opening win. Watching Clayton Kershaw in the very first game of the 2014 season, I realized that he’s not overpowering; he’s deceptive. It’s the sum of his parts that makes the Los Angeles Dodgers ace baseball’s most successful pitcher. In the fourth inning against Arizona on Friday, Kershaw was hitting 87-to-89 mph with his fastball, roughly the same velocity a Diamondbacks starter Wade Miley. During the inning, Arizona’s Mark Trumbo got a fastball, waist high, on the inside of the plate. Trumbo has pummeled this same pitch off walls or fake rocks beyond the wall in Anaheim multiple times in his career. He did everything right mechanically on Kershaw’s pitch. Despite his stance and swing being perfect, the result was a weakly hit ball to second base. I had my share of failures at the plate as a MLB player, but I was always pretty confident against left-handed pitching. I had no fear stepping in the box against guys like CC Sabathia or Cliff Lee. While with the Milwaukee Brewers, I had only one at-bat against Kershaw in the spring of 2008. At that point, Kershaw was a baby, never having stepped foot on a MLB mound during the regular season. Our dugout had heard his name plenty leading up to the game. There was quite a buzz about the young lefty in Maryvale, Ariz., that day. A sharp breaking ball and a straight fastball got me to a 2-0 count. As expected, I got a fastball in the middle of the plate on the next pitch. I identified the pitch as such, fired my hips and connected, beating the ball firmly on the ground to the third baseman. The result? A groundball out. 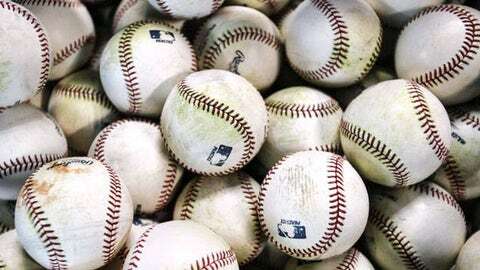 I jogged back to the dugout, realizing I had been whipped on the pitch — a heavy fastball that crept on me just enough so I was unable to get the ball in the air. I missed my sweet spot by a millimeter. That’s all it takes to turn a line drive double into an innocuous dribbler. Kershaw packs his lunch with a heavy fastball. “Heavy” describes how the ball feels when it hits your bat. It makes the wood feel cumbersome. 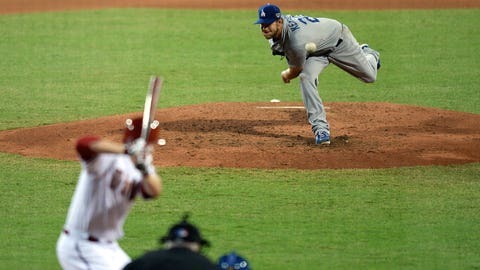 Additionally, and perhaps the least illuminated factor in Kershaw’s arsenal, is a pause in his delivery as he kicks his lead foot toward the ground. As hitters, we are dependent on timing. This quick pause throws off their rhythm, giving Kershaw yet another edge. This is indeed the case of a guy having every gift. Kershaw isn’t all about a deceptive delivery and a bowling ball for a fastball. His curveball is arguably among the top five in the sport. There is nearly a 20 mph difference between Kershaw’s average fastball velocity and that of his devastating 12-6 breaking ball (12-6 meaning the ball appears to the batter as if it drops from the 12 o’clock hand to th 6 o’clock hand). As a hitter, if I’m geared up for the heavy fastball that difference in velocity is nearly insurmountable. Perhaps that’s why the league hits roughly .083 against the pitch Vin Scully likes to call Public Enemy No. 1. There are pitchers with better pure stuff than Kershaw. There are pitchers with better command and location. But there isn’t a man on Earth with a better combination of components than the already heavily decorated 26-year-old. Maybe that’s why he baffled the Diamondbacks — one run, five hits, one walk, seven K’s in 6 2/3 innings of a 3-1 win — on Day One of the 2014 season despite a pedestrian velocity. That’s why the Dodgers gave him over $215 million over seven years. If anybody is earning his paycheck, it’s Kershaw. On days when his best stuff is unavailable, Kershaw is uniquely equipped to beat hitters with remarkable consistency. Hold your breath, folks. You may be watching one of the best pitchers in MLB history in his prime.